Last night's tactics at North Frederick St by balaclava-wearing Gardaí will ultimately have won support for housing activists, writes Matthew Murphy. Last night’s eviction of the housing protesters in Frederick Street marked a dramatic escalation in the fight against Dublin’s rapidly growing housing problem. As masked Gardaí watched on, forcibly preventing enraged protesters and shocked passers by from intervening, balaclava-sporting employees of an unidentified private security firm employed brutally heavy-handed and overtly aggressive tactics to remove members of the Take Back the City group, who have occupied the building for the past 25 days. Over the past 24 hours, the images of masked Gardaí working in tandem with unidentified private security guards have spread quickly across social media, unsurprisingly evoking cries of outrage from the general public. Today, numerous politicians have criticised the actions of the Gardaí in supporting and protecting the behavior of the security contractors drafted in by the landlord. Public mood, which had previously suffered from overwhelming apathy towards the plight of the protestors, has now decidedly swung against Dublin’s landlords. For landlords across Dublin, the eviction of the protestors in nothing more than a pyrrhic victory. Within the Irish psyche there is a unique and deeply ingrained hatred of bailiffs and evictions, stretching back hundreds of years. In a country with such a tortured history of evictions and absentee landlords, the question of housing and the right to own land has always been a particularly sensitive one. Every politician, developer and banker would be negligent not to be aware of that history when dealing with housing. However, in this case it seems that impatience and anger on the part of the landlord has triumphed over a recognition of the political reality. The end results are images of balaclava-clad men on the doorsteps of a Dublin city home, images which evoke memories of the worst of Ireland’s history, from the evictions by absentee landlords in the 18th century, to the actions of the balaclava-toting IRA gunmen during the troubles. The knock-on effect of this has been the galvanisation of a campaign which in recent weeks, seemed to be waning as it increasingly lost public attention. A march has already been announced for this evening, and is widely expected to be well attended in light of the outrage that has followed last night’s events. Furthermore, members of the group itself will undoubtedly be radicalised in the face of such overt aggression. With several members injured, including some students, their determination to continue their campaign and disrupt the activities of Dublin’s landlords will surely escalate from here on. Put simply, last night’s actions were a spectacular own goal by the landlord, with potentially devastating consequences for the landlord class across the city. From the government’s perspective, these protests are now more than a mere inconvenience. While questions have largely been batted away to this point, as the protestors gear up for yet another march tonight, their core support has surely been magnified by the use of such heavy-handed and intimidating tactics by the Gardaí and the owners of the property. Meanwhile, support for their campaign by the public at large has grown exponentially over the past 24 hours, with many members of the public horrified by the images now viral on social media. As the protestors show no signs of backing down, it is surely time for the state to, at the very least, engage with the reality of the situation. 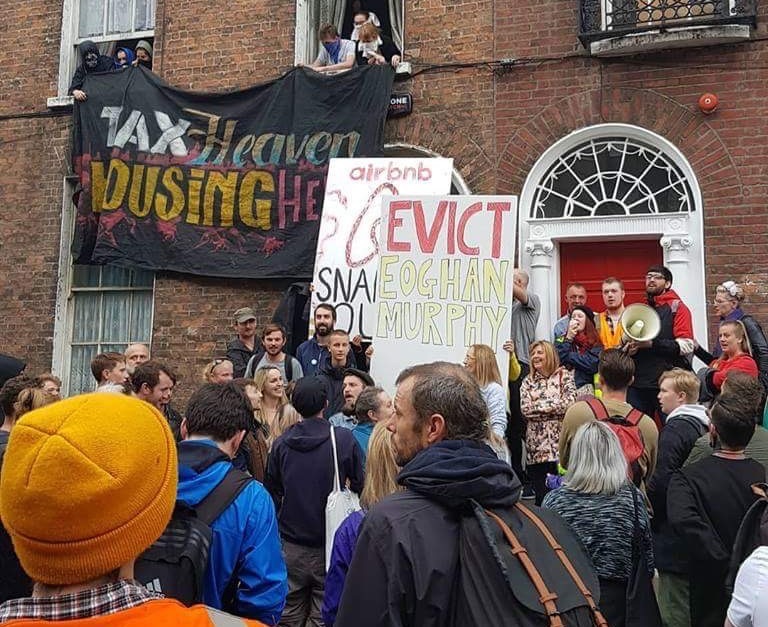 While Minister for Housing Eoghan Murphy had pledged to meet the protesters – who changed tack at the last minute and decided to demand his resignation instead – since then there has been an almost deafening silence from the government with regard to the protests. For Murphy’s department, engagement with the protestors is now critical, as in the absence of any firm action from the government, these protests will only escalate. Last night’s violence set a marker by the state, and experience dictates that once violence emerges in such contentious situations, it inevitably escalates. Perhaps most importantly of all for Leo Varadkar’s government is the increasingly tenuous position of Eoghan Murphy. As Dublin’s rental crisis continues to worsen, the effects of which have now spilled over into violence on the streets of the capital, Varadkar must surely consider whether Murphy is truly the man to tackle the most pressing issue facing the government. With Sinn Féin having already tabled a motion of no confidence, Varadkar must decide whether Murphy and his housing strategy, which thus far has led to record levels of homelessness and now violence on the streets, can retain the confidence of the government to tackle what has emerged as the most pressing social issue of the day.